Antibacterial-resistant strains and species, occasionally referred as “superbugs”, now contribute to the emergence of diseases that were well controlled few decades ago. In a recent report “Antibiotic Resistance Threats in the United States, 2013,” CDC calls this as a critical health threat for the country. According to the report more than 2 million people in the United States get antibiotic resistant infections each year and at least 23,000 of them die annually. Now, this is the situation in a country where drug regulations are quite tough and stringent and physicians are relatively careful in prescribing medications. Imagine the situation in developing countries like India, where antibiotics are available over the counter without medical prescription and more than 80-90% of population use antibiotics without physician’s consultation. In fact they are not even aware of the proper use of the antibiotic course. This is again a huge health challenge that will pose even more serious threat in coming years in treating antibiotic resistant infections. Recently, in a clinic in Mumbai some 160 of the 566 patients tested positive for TB between March and September that were resistant to the most powerful TB medicine. In fact, more than one-quarter of people diagnosed with tuberculosis have a strain that doesn’t respond to the main treatment against the disease. According to WHO and data from Indian government, India has about 100,000 of the 650,000 people in the world with multi-drug-resistance. Inappropriate treatment and misuse of antibiotics has contributed maximum to the emergence of antibacterial-resistant bacteria.Many antibiotics are frequently prescribed to treat diseases that do not respond to these antibacterial therapies or are likely to resolve without any treatment. Most of the time incorrect or suboptimal doses of antibiotics are prescribed for bacterial infections. Self-prescription of antibiotics is another example of misuse. The most common forms of antibiotic misuse however, include excessive use of prophylactic antibiotics by travelers and also the failure of medical professionals to prescribe the correct dosage of antibiotics based on the patient’s weight and history of prior use. Other misuse comprise of failure to complete the entire prescribed course of the antibiotics, incorrect dosage or failure to rest for sufficient recovery. Other major causes that contribute to antibiotic resistance are excessive use of antibiotics in animal husbandry and food industry and frequent hospitalization for small medical issues where most resistant strains gets a chance to circulated among the community. To conclude, humans contribute the most to the development and spread of drug resistance by: 1) not using the right drug for a particular infection; 2) not completing the antibiotic duration or 3) using antibiotics when they are not needed. In addition to the growing threat of antibiotic-resistant bugs, there may be another valid reason doctors should desist from freely prescribing antibiotics. According to a recent paper published online in Science Translational Medicine, certain antibiotics cause mammalian mitochondria to fail, which in turn leads to tissue damage. Antibiotic resistance is a condition where bacteria develop insensitivity to the drugs (antibiotics) that generally cause growth inhibition or cell death at a given concentration. a) Intrinsic or natural resistance: Naturally occurring antibiotic resistance is very common, where a bacteria may be simply, inherently resistant to antibiotics. For example, Streptomyces possess genes responsible for conferring resistance to its own antibiotic, or bacteria naturally lack the target sites for the drugs or they naturally have low permeability or lack the efflux pumps or transport system for antibiotics. The genes which confer this resistance are known as the environmental resistome and these genes can be transferred from non-disease-causing bacteria to the disease causing bacter, leading to clinically significant antibiotic resistance. b) Acquired resistance: Here a naturally susceptible microorganism acquires ways not to get affected by the drug. Bacteria can develop resistance to antibiotics due to mutations in chromosomal genes or mobile genetic elements e.g., plasmids, transposons carrying antibiotic resistance genes. Genetic resistance: It occurs via chromosomal mutations or acquisition of antibiotic resistance genes on plasmids or transposons. Phenotypic resistance: Phenotypic resistance can be acquired without any genetic alteration. Mostly it is achieved due to changes in the bacterial physiological state. Bacteria can become non-susceptible to antibiotics when not growing such as in stationary phase, biofilms, persisters and in the dormant state. Example: Salicylate-induced resistance in E. coli, Staphylococci and M. tuberculosis. Examples of transfer of resistance genes through plasmid are; Sulfa drug resistance and Streptomycin resistance genes, strA and strB while the transfer of resistance gene through transposon occurs via conjugative transposons in Salmonella and Vibro cholera. In the next post, I will discuss few important examples of antibiotic resistance in clinically relevant microbes. With the increasing advancement of technology and research progress, modern medicine has found cure for several diseases which were considered to be incurable few decades ago e.g. cardiovascular diseases, various cancers, tuberculosis, malaria and infectious diseases. However, till date no single drug is shown to be 100% efficacious for treating a certain diseased condition without exhibiting adverse drug effects. It is now a well recognized fact that each patient respond differently to a given drug treatment for a similar disease. With a particular drug, desirable therapeutic effects could be obtained in few patients where as others may have modest or no therapeutic response. Besides, many patients might experience an adverse effect that also varies from mild to severe and life-threatening. Studies have shown that with a similar dose, plasma concentration of a certain drug might vary up to a difference of 600 fold among two individuals of same weight. Such inter-individual variations occurring in response to a drug might be a consequence of complex interaction between various genetic and environmental factors. Genetic factors are known to account for approximately 15-30% inter-individual variability in drug disposition and response, but for certain drugs it could also account for 95% variations. For the majority of the drugs, these differences are largely ascribed to the polymorphic genes encoding drug metabolizing enzymes, receptors or transporters. These polymorphic genes mainly influence important pharmacokinetic characteristics of the drug metabolism e.g. drug absorption, distribution, metabolism and elimination. The first report of an inherited difference in response to a foreign chemical or xenobiotic was inability to taste phenylthiocarbamide. Another example which showed that drug response is determined by genetic factors which can alter the pharmacokinetics and pharmacodynamics of medications, evolved in late 1950s, when an inherited deficiency of glucose-6-phosphate dehydrogenase was shown to cause severe hemolysis in some patients when exposed to the antimalarial drug primaquine. This discovery elucidated why hemolysis was reported mainly in African-Americans, where this deficiency is common, and rarely observed in Caucasians. Other established evidences of inter-individual variations observed in response to suxamethonium (succinylcholine), isoniazid, and debrisoquine were also linked with a genetic connection. The discovery that prolonged paralysis following the administration of succinylcholine was the result of a variant of the butyryl-cholinesterase enzyme, and peripheral neuropathy occurring in a large number of patients treated with antituberculosis drug isoniazid was an outcome of genetic diversity in the enzyme N-acetyltransferase 2 (NAT2) are excellent examples of “classical” pharmacogenetic traits altering amino acid sequence. These observations of highly variable drug response, which began in the early 1950s, led to beginning of a new scientific discipline known as pharmacogenetics. Vogel in 1959 was the first to use the term pharmacogenetics but it was not until 1962, when in a booy by Kalow, pharmacogenetics was defined as the study of heredity and the response to drugs. The term pharmacogenomics was later introduced to reflect the recent transition from genetics to genomics and the use of genome-wide approaches to identify the genes that contribute to a specific disease or a drug response. The term pharmacogenomics and pharmacogenetics are many times used interchangeably. Pharmacogenomics is an emerging discipline that aimed at studying genetic differences in drug disposition or drug targets to drug response. With the availability of more sophisticated molecular tools for detection of genetic polymorphisms, advances in bioinformatics and functional genomics, pharmacogenomic based studies are generating data which is used in identifying the genes responsible for a specific disease or the drug response. There is emerging data from various human genome projects on drug metabolizing genes that is rapidly elucidated and translated into more rational drug therapy towards a personalized medicine approach. Many physicians are now reconsidering whether “One Drug for All” approach is ideal while prescribing medicines to treat a certain condition in different individuals. Various studies have now reported genotype- phenotype association studies with reference to many diseases where respective drug metabolizing genes and receptors are highly polymorphic. In the last decade, FDA has increasingly acknowledged the importance of biomarkers and formulated new recommendations on pharmacogenomic diagnostic tests and data submission. Personalized medicine is at times deemed to be a future phenomenon; however it is already making a marked difference on patient treatments especially in various cancers. Molecular or genetic testing is now available for colon, multiple myeloma, leukemia, prostrate and breast cancer patients, hepatitits C and cardiovascular diseases where one can identify their genetic profile and based on that it can be predicted whether patients are likely to benefit from new drug treatments simultaneously minimizing adverse drug reactions. Recently, at MD Anderson Cancer Center, “Institute for Personalized Therpay” was created particularly to implement personalized cancer therapy for improving patient outcomes and reducing treatment costs. Personalized medicine might guarantee many medical innovations but its implementation is associated with several challenges regarding public policy, social and ethical issues. Individual may not opt or participate in the genetic research as they feel it might breach their right for privacy and confidentiality. To tackle these challenges, “2008 Genetic Information Nondiscrimination Act” was designed to shield individuals from genetic discrimination. Apart from this, other existing concerns are: ownership of genetic materials, medical record privacy, clinical trial ethics, and patient’s knowledge on the consequences of storing genetic materials and phenotypic data. These concerns must be addressed for the satisfaction of all the stakeholders, especially the patients on reaching a common consensus as how to manage pharmacogenomics applications into clinical practices. Interdisciplinary research has immense potential. I have talked about one of the major discoveries of modern science based on interdisciplinary research in my previous blog, posted on 29th July 2013 (http://blog.manuscriptedit.com/2013/07/ interdisciplinary-research-nobel-prize-chemistry-won-biologists/). Today, let us take another example, where one chemist and one physicist came together and presented us with the direct image of internal covalent bond structure of a single molecule using one of the advanced imaging tools, non-contact Atomic force microscope (nc-AFM). Dr. Felix R.Fischer (http://www.cchem.berkeley.edu/frfgrp/), a young Assistant Professor of Chemistry at University of California (UC), Berkeley along with his collaborator Dr. Michael Crommie (http://www.physics.berkeley.edu/research/crommie/home), also a UC Berkeley Professor of Physics captured the images of internal bond structure of oligo (phenylene-1, 2 ethynylenes) [Reactant1] when it undergoes cyclization to give different cyclic compounds (one of which is shown in the inset picture http://newscenter.berkeley.edu/2013/05/30/scientists-capture-first-images-of-molecules-before-and-after-reaction/). Chemists generally determine structure of molecules using different spectroscopic techniques (NMR, IR, Uv-vis, etc.) in an indirect manner. The molecular structures, we generally see in the textbooks result from the indirect way of structure determination, either theoretical or experimental or both. It is more like putting together various parts to solve a puzzle. But now, with this ground breaking work of two scientists from UC Berkeley, one can directly see for the very first time in the history of science, how a single molecule undergoes transformation in a chemical reaction, how the atoms reorganized themselves at a certain condition to produce another molecule. No more solving puzzle for next generation of chemists to determine the molecular structure. Well, it was not easy task for the scientists to come up with these spectacular molecular images. Imaging techniques such as scanning tunneling microscopy (STM), tunneling electron microscopy (TEM), have their limitations, and are often destructive to the organic molecular structure. Advanced technique like nc-AFM where a single carbon monoxide molecule sits on the tip (probe) helps in enhancing the spatial resolution of the microscope, and this method is also non-destructive. The thermal cyclization of the Reactant 1 was probed on an atomically cleaned silver surface, Ag(001) under ultra-high vacuum at single molecular level by STM and nc-AFM. Before probing, the reaction surface and the molecules were chilled at liquid helium temperature, 40K (-2700C). 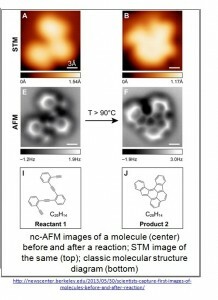 Then the researchers first located the surface molecules by STM and then performed further finetuning with nc-AFM, and the result is what we see in the inset picture. For cyclization, the Reactant 1 was heated at 900C, the products were chilled and probed. Chilling after heating did not alter the structure of the products. The mechanism of thermal cyclization was also clearly understood, and the mechanistic pathway was in agreement with the theoretical calculations. 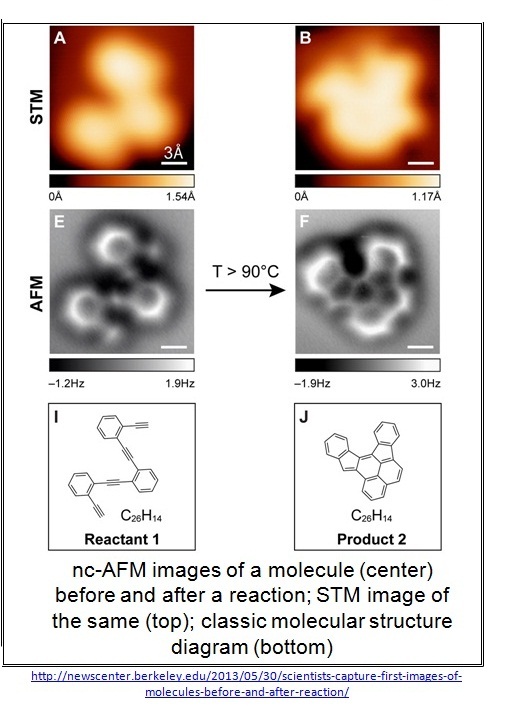 From the blurred images of STM, Dr. Fischer and Dr. Crommie along with their coworkers presented us crystal clear molecular images with visible internal bond structure. This ground breaking work shows the potential of nc-AFM and unveils secrets of surface bound chemical reactions which will definitely have a huge impact on oil and chemical industries where heterogeneous catalysis is widely used. This technique will also help in creating customized nanostructure for use in electronic devices. Again this path breaking work was possible due to the collaborative research between chemists and physicists. Hence, the interdisciplinary researches have endless potential. Psychographics refers to the lifestyle, values, leisure activities and social self-image that the readers are likely to have. Marketing research shows that people react favorably towards products and services that they see as representative of themselves. Similarly, your readers will respond differently to your message according to their values. What are their interests, opinions and hobbies’? In the rapidly changing and diversifying contemporary world, interests and values are less and less tied to demographic issues. For example, when computer games first started to develop, they were associated with a target market of young males in the 15 to 25 age group. As this form of entertainment evolved, the target market changed, and there are now computer games that attract females, older males, and other demographic groups. An analysis of the computer game market, therefore, is more likely to benefit from a psychographic examination that would see the computer game market as a special interest group, rather than a demographic. Demographic and psychographic analysis are especially relevant in journalistic and public relations writing, where you address a wider public. Every act of writing takes place in a new context, with a unique time, place or reader to take into account. Audience adaptation refers to the skill of arranging words, organizing your thoughts, and formatting your document to best achieve your desired effect on your target audience. Audience dynamics refers to the relationship that writers form with their readers through their style, and through the amount and structure of information they provide. The audience dynamics are effective when the readers get a sense of satisfaction that the questions raised in the text were relevant to their interests and the answers or solutions provided were convincing. In contrast, audience dynamics are ineffective when the readers feel frustrated or offended because the writer’s tone is condescending, the answers or solutions provided are simplistic in relation to the complexity of the questions, or the argument is emotive and based on generalization. To maximise your ability to achieve effective audience dynamics, assess the readers’ needs, knowledge and interest by conducting an audience analysis before writing. Audience analysis is an integral part of your research.